Big & Tall Work To Weekend® Khaki is rated 3.9 out of 5 by 52. 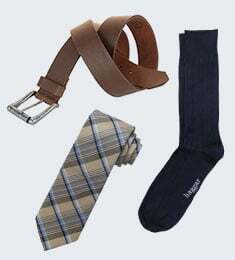 Rated 5 out of 5 by drjack11 from Great slacks Never bought slacks on line before. Thought they wouldn’t be sized right. Boy did this change my mind. Great fit. Great style. And great price. I’ll do this again. Rated 5 out of 5 by grateful from Husband is happy I bought these pants for my husband and he loves them. Fit is great! Rated 4 out of 5 by GOLFMAN69 from GREAT FIT Product I purchased is excellent. My only complaint is you never have my combination in OLIVE. 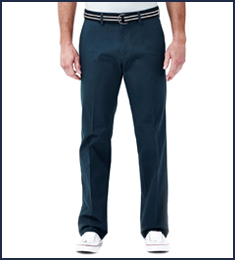 Rated 4 out of 5 by Scott9742 from Nice looking These pants are nice looking and fit me well. The price was reasonable and they were shipped in a timely fashion. 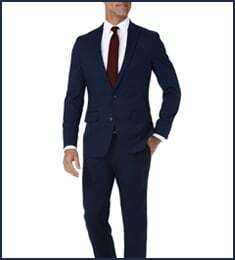 Rated 2 out of 5 by CaptainAmerica007 from Odd Bulging I started purchasing all of my pants at Haggar about 6 months ago. I have enjoyed every type of pants I have purchased up until I purchased these. After trying on all four pairs of pants, I ended up just giving these to Goodwill. The material around the pleats bulged out so far, the pants looked like clown pants. Even worse when I sat down. Didn't even take the tags off of 3 of the pair. Rated 5 out of 5 by York from Needed long rise and got long rise..good fit. Delivery timely. Fit as expected. Quality good as usual. 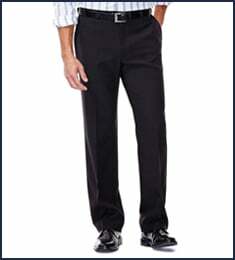 Rated 5 out of 5 by Buzz49 from Best Materials, stretch waist, Haggar pants both work and dress fit me great. Happy with purchase.